Natasha L. Martin-Egwuonwu believes Christians can learn a lot from sharing their own walks of faith – be they triumphant or painful – and that every person’s story contains something of value that can be used to bring others closer to Christ. 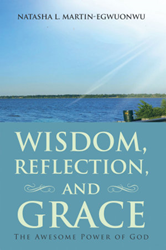 In “Wisdom, Reflection, and Grace: The Awesome Power of God” (published by Abbott Press), Martin-Egwuonwu shares her personal life story to teach readers who are seeking to build an intimate relationship with God how no battle is too difficult for the Lord. The book deals in how God can help in any situation, from everyday problems to seemingly insurmountable tragedies. Martin-Egwuonwu encourages readers to dedicate their lives to Christ, who “will give you something far greater in return.” Through this commitment, Martin-Egwuonwu promises the void many feel will be filled by God’s glory. Natasha L. Martin-Egwuonwu is a Bible teacher, educator, blogger and first-time author. She is currently pursuing a doctorate in education. She is grateful for the journey that God has blessed her with. Martin-Egwuonwu and her husband live in Oklahoma, with their son.